Hello XXXXX, We can certainly make this order to your specifications. You asked for transparent background and to stick on the inside of the glass. That process is called Print and Cut vinyl. This current product is just Printed vinyl with a white background. The cut process is a bit more complicated and we charge an extra fee for the process as it becomes custom work. First, we have a couple of things to discuss. 1. Ninety nine percent of the window vinyl we do is for the outside of the glass. If the vinyl is placed on the inside it becomes harder to read because of the reflections, reading surface being at another depth and lighting issues. Usually, if a customer is specifically requesting inside of glass, it is because of the threat of vandalism or other aesthetic things. If that isn’t the case, we would highly recommend outside of glass installation. Our Print and Cut vinyl is outdoor durable. 2. Ninety nine percent of the window vinyl we do has white or lighter color lettering as predominate. This is because the insides of the building tend to be darker when viewed from outside through glass. When you add the combination of dark lettering, dark building interior and inside of glass install, you have signage that will not be seen or read. We would love to discuss these options with you and feel we can perfectly satisfy your needs. Feel free to call 770-979-8387 and ask for one of our Custom Work Associates and mention your Order ID XXXXX to get started. This email will be in the order notes. If all of this is more than you want to deal with, we are happy to refund the full amount for the order. Let us know. Thank you for choosing A Better Sign. You ordered a sign with the Greek letters. Unfortunately, the owners of the copyright for this type image has previously served our company with a cease and desist order not to use the copyright. They also solicited us for payments if we want to use them and furthermore stated that customers like yourself are not allowed to use them either except through licensed providers. It is not worth our time to explore whether or not the image you have provided is covered by their copyright. We can print the sign without the OA image or refund your payment to the card. Or, you can provide artwork that is acceptable. So sorry for this news. Let us know how to proceed. You ordered the Large FalconFeather Flag without the hardware kit. Apparently you have the hardware kit from your previous old orders. Unfortunately we changed hardware a number of years ago and the new flags do not fit the old hardware. In order to use this new flag you will also need to buy the new hardware also. You will find it on this page https://abettersign.com/Products/breezyflags/ in the Replacement Hardware tab (see attached screen shot). The item you need to Buy is the Large: Pole & Spike $42.00 Let me know if you need to cancel and refund instead. You already have a design order submitted from our Online Design tool. There are two features that may be useful after the order is submitted. 1. Revise Design. This will allow you to open a design and revise it. You can change it any way you desire as long as it hasn't been locked for production. If it is locked, please call us as it may be possible to hold the order for your revisons. 2. Start New Order based on this design. This will allow you to load a previous design into the Online Designer tool and place a completely new order using the design. On your original confirmation email is a text link to Revise Design or Start New Order. After clicking that link a page will open with instructions for both methods. In the cart choose the Wet Erase option with marker. In the Shipping screen Notes to Staff type this "I want Dry Erase NOT Wet Erase. I understand I will NOT receive a marker and price will be the same as for the Wet Erase option"
Hi XXXXXX. No need to “cancel” orders unless they are paid. Unpaid orders just remain in the system on hold until they are paid. Our system sends an automated email giving the opportunity to pay if you want to proceed with the order. If at any time you wish to continue with the order, just simply pay it and it will become active. Thank you for considering A Better Sign. Hi XXXXXXX. We have the XXXXXXX sign templates setup on our site that you can customize for no additional charges. You can complete the order process by choosing the “XXXXXXX” button for the 18x24 For Sale sign template here XXXXXXXXXXXXXX Change the text and other info on the template to your desired info. Add to cart, choose options and submit thru to payment. It’s pretty simple and we will be happy to help you along the way by chat or phone. If we place the order for you, we have an additional charge of $25.00. If want us to do so, we will need to get more details from you of the type of materials, frames and options you desire. If you need to discuss further, please give us a call. Thank you for considering A Better Sign. We don’t have a pricing schedule for all the sizes, but we do have a formula. Find the square inches of your sign. Example 24”x6” Rider: 24x6=144 sq in Double sided is additional $.042 per square inch. 144x.042=$6.00 Single sided is additional $.021 per square inch. 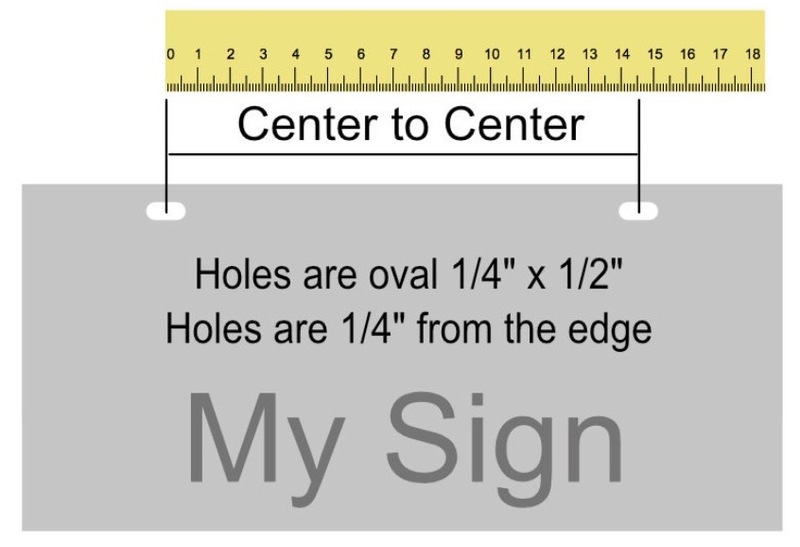 144x.021=$3.00 So get your base price of the sign and add the formulated amount plus any other options such as aluminum, duraplast, grommets etc. Quantity pricing will be slightly lower depending on quantity. Yes, we can make signs reflective. It is not an option on our site, but we do it often. The best way to get that done is to submit the order as you would normally, but in the Shipping screen in “Notes to Staff” type a note there about reflective. When you get to the payment screen choose “Pay Later…”. We will calculate the additional charge and change the order for your approval and payment. Hi XXXXXX. You can easily edit one of our online templates and do that yourself at no additional charges https://abettersign.com/Products/yardsigns. Pricing can be found in the Pricing tab on that page choosing the options you desire. A single sided corrugated plastic sign starts at $XXXXX and double sided starts at $XXXXX. Options such as upgraded materials and frames cost extra. We normally have a setup fee starting about $25 if we do the design for However, I think you will find the online do-it-yourself process very fast and easy. Let me know if you need assistance or want us to do this for you. Thank you for considering A Better Sign. This offer and code was probably found using online search. Sorry to say these offers are usually bogus scams. We do not have a discount like this. However, after placing your first order, we do send a new customer 10% discount code by email to use for your next order and we occassionally offer discounts through email and advertisement on our site. Thank you for your submittal for signs. We can certainly do this work for you, but we have a $20 minimum fee to do the setup. Scroll down the page till you see the XXXXXXX template (see sample attached). Click the Design it Now button to load the template. Change the XXXXX and text with your information, add to cart and checkout. If you still want us to do it for you, no problem. Just reply back here. We can ship to Canada, but only as a custom order. You can submit an order and at shipping, enter the shipping details and choose Pickup At A Better Sign. At payment choose Submit Only, Pay Later. We will calculate shipping charges and get an email to you. Or, you can use the Submit Request at top of the site also with a full description of what you want and wait for us to respond with details. Thank you for considering A Better Sign.